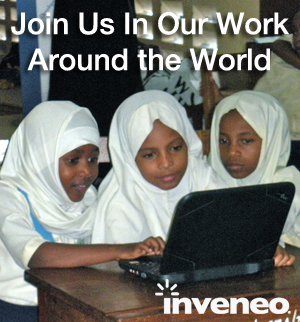 In early 2012, Inveneo launched an ambitious large-scale WiFi network across northern Uganda. Led by Oxfam Novib and in partnership with Arid Lands Information Network, Samasource and CLS Ltd., the project will establish 100 Information and Communications Technology (ICT) work centers in rural communities. The program aims for financial sustainability, precluding the need for any outside subsidy to maintain the centers. Deliver educational lessons in areas such as English language learning and agricultural best practices. Be operated and managed by the local community. To ensure the program’s success, Inveneo will design and deploy a network to deliver reliable, affordable and high-speed Internet connections between the backbone infrastructure and all center locations. CLS Ltd., an Inveneo Certified ICT partner in Uganda, will work side by side with us in the installation of the network and will outfit each of the centers with solar energy and low-power computer systems. The areas served by Internet Now! will span from Gulu, a district rebounding after more than 20 years of civil war, to Moyo, a town fewer than five miles from the border with South Sudan. Internet Now! has been funded through a prestigious competition hosted by the Dutch Postcode Lottery with Oxfam Novib as the project lead.